Our new multi-purpose wheelchair scales are the leading edge in electronic weighingâ€”offering the ultimate in convenience to operator and patient. A paper-tape printer automatically prints out patient weight providing a permanent, accurate record. Only Scale-Tronix scales automatically return to zero. All other scales require manual zeroing for each weighing by pushing a button or turning a knob. Ours are the only wheelchair scales that allow you to weigh a continuous stream of patients without zeroing in between. A recall feature retains the last weight reading after the patient has left the scaleâ€”for any period of time until the next patient is weighed. If the patient gets off the scale and the operator forgets the weight, simply press the â€œRecallâ€� button. The previous weight is displayed and a â€œPrior Weightâ€� message blinks. In addition, the press of a button allows reweighing while the patient is still on the scaleâ€”thereâ€™s no need to get off. This is useful if a patient carries extraneous objects onto the scale. Audible signals indicate when patientâ€™s weight is stored in memory. 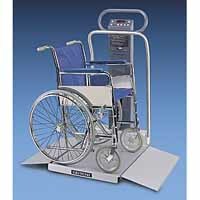 Scale-Tronix wheelchair scales are battery operatedâ€”six D-size batteries last one year, or approximately 20,000 weighings. No power cords. The scaleâ€™s ergometric design is perfectly balanced to roll effortlessly. The low-profile platform remains motionless while weighingâ€”provides accurate weight on any floor surface, even carpeting. Wheelchair, chair and stand-on scale. Platform - Low profile, 24"w X 26"d X 2"h, with heavy-duty rubber wheels. Accuracy - 1/10 lb-100 gm. Weighing Range - 880 lbs-400 kg. Readout - Digital LED in lb/kg. Power Source-Cordless - 6 D-size disposable batteries. Line cord available on special order. Automatic Zero - Returns to zero, ready for the next patient. Audible Signal - Indicates weight is in memory. Successive Weighing - Weigh a continuous stream of patients without re-zeroing. Handrail - (Accessory) Heavy-duty stainless steel. Height Gauge - (Accessory) Stainless steel, in/cm. Printer - (Accessory) Built-in, paper-tape, uses standard thermal paper.